Amazon founder Jeff Bezos, rated the world's wealthiest person, announced Wednesday on Twitter that he and his wife MacKenzie Bezos were divorcing after a long separation. 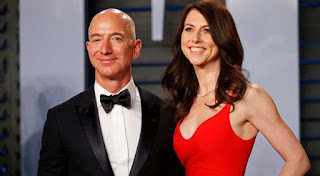 "We want to make people aware of a development in our lives," Jeff Bezos, 54, and MacKenzie Bezos, 48, said in joint statement posted to Bezos' "As our family and close friends know, after a long period of loving exploration and trial separation, we have decided to divorce and continue our shared lives as friends." The Bezoses said they felt "incredibly lucky" for their 25 years together and would remain involved with each other as close friends and parents. acKenzie Bezos is the author of two books, including "The Testing of Luther Albright," a psychological novel about the challenges facing a Sacramento, California father and his family after an earthquake. mazon this week passed Microsoft to become the world's biggest publicly traded company by market capitalization.